ARTISAN CRAFTED - This 8" x 6" x6" wood arched top Treasure Chest is entirely hand made. 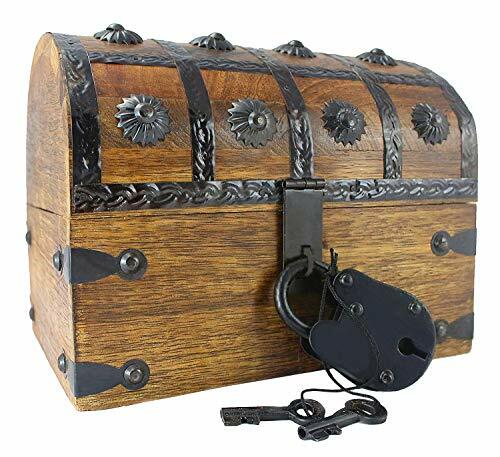 From the iron banded decorations to the crafted wood body to the primitive solid iron lock with skeleton key - we pay attention to each detail so that each chest is a unique heirloom LOVE IT OR YOUR MONEY BACK AND LIFETIME WARRANTY - Everyone who gets our treasure chest patent as a gift absolutely loves it! But if you don't like it for any reason simply contact us for a full refund. ARTISAN CRAFTED: With inlaid cast iron around this handcrafted polished wood comes an ideal adventure pirate chests. With attention to detail each chest is equipped with a midnight black hasp that can be fit with the included lock. A hinged lid and fully functional lock and key keep your treasure safe from anyone. Great for use as keepsake, stash, or decorative box. TREASURE SET: A pirate is never fully prepared for his journey without a safe place to put his treasure. With new experiences and relationships through thrilling adventure, it is time to be free-spirited and courageous in the physical world, simply by boarding a ship and pointing towards the horizon. Especially in contrast to our fast-paced lives of today, the pirate life is appealing. ATTENTION TO DETAIL: This distressed wood arched top treasure chest is entirely hand made to look like a real used pirate chest. From the iron banded decorations to the crafted wood body and primitive solid iron lock with skeleton key - we pay attention to each detail so that each chest is a unique heirloom. Keep your treasure safe from a Kraken or store your other pirate toys for safekeeping. NCLUDES: 1 Blackbeard chest with an 8" x 6" x 6" exterior and a 7" x 5" x 5" interior measured to the arch alongside a fully operational 2" lock and 2 skeleton keys this chest is great for storing keepsakes and jewelry or to hide pirate booty in a treasure hunt.